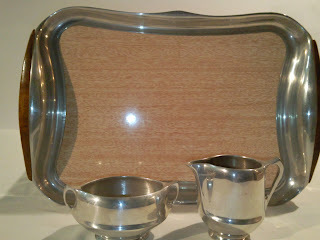 Piquot Ware (expensive and collectible) matching creamer, sugar bowl and tray. Highly polished aluminium magnesium alloy (one piece castings - machine finished) with sycamore wood handles. This set is stamped "T6" and may date from as early as 1949. Collection from Evanston/Gawler. Would like $40 for the set.